INSTANT FAMLY. (DVD Artwork). ©Paramount Pictures. The heartwarming adoption dramedy “Instant Family,” arrives on Blu-ray Combo Pack and DVD Tuesday March 5 from Paramount Home Media Distribution. The Mark Wahlberg/Rose Byrne starrer also is available now on Digital. The Blu-ray Combo Pack comes loaded with more than an hour of bonus material. Go behind the scenes and see how the cast and crew brought the story to life, and meet writer/director Sean Anders’ real-life family, who served as the inspiration for the film. Plus, watch deleted and extended scenes and a gag reel as well as a commentary with Anders and writer John Morris, and more. When Pete (Wahlberg) and Ellie (Byrne) choose to start a family, they stumble headfirst into the world of foster care adoption. After they learn their perfect foster child comes with two other siblings, Pete and Ellie find themselves speeding from zero to three kids overnight and must hilariously learn the ropes of instant parenthood if they hope to become a real family. 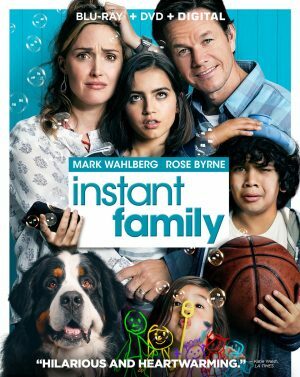 “Instant Family” also stars Isabela Moner, Margo Martindale, Julie Hagerty and Oscar winner Octavia Spencer. “Creed II” arrives on 4K Ultra HD Combo Pack, Blu-ray Combo Pack and DVD on Tuesday March 5. This latest installment in the long-running boxing drama franchise already is available on Digital. 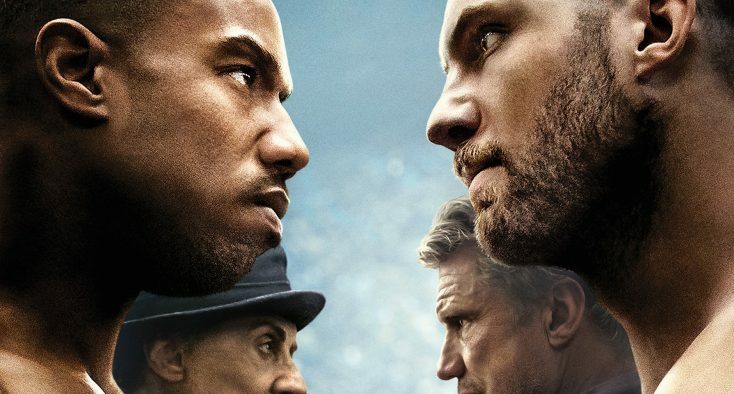 From Metro Goldwyn Mayer Pictures (MGM), Warner Bros. Pictures and New Line Cinema, “Creed II” stars Michael B. Jordan (“Black Panther,” “Creed”) and Sylvester Stallone (the “Rocky” films, the “Rambo” movies), reprising their roles as Adonis Creed and Rocky Balboa. Also returning are Tessa Thompson (“Thor: Ragnarok”), Phylicia Rashad (“Steel Magnolias”), Wood Harris (“Remember the Titans”), Andre Ward, Florian Munteanu (“Bogat”), Russell Hornsby (“The Hate U Give”) and Dolph Lundgren (“The Expendables” movies), returning to the franchise as Ivan Drago. RLJE Films will release “The Standoff at Sparrow Creek” on DVD and Blu-ray on Tuesday March 5. Written by Henry Dunham, who is also making his feature directorial debut, the film stars James Badge Dale (“13 Hours”), Chris Mulkey (“Captain Phillips”), Brian Geraghty (NBC’s “Chicago P.D.”), Robert Aramayo (HBO’s “Game of Thrones”), Patrick Fischler (Showtime’s “Twin Peaks”), Happy Anderson (Cinemax’s “The Knick”) and Gene Jones (“The Hateful Eight”). “The Standoff at Sparrow Creek” will be available on DVD for a suggested retail price (SRP) of $27.97 and on Blu-ray for $28.97 (SRP). Some treasures are better left unfound when “The Vanishing” arrives on Blu-ray (plus Digital) and DVD Tuesday March 5 from Lionsgate. This film is currently available on Digital and On Demand. Based on a true story, this suspenseful thriller follows the lives of three lighthouse keepers whose worlds are turned upside down with paranoia and greed following the discovery of lost treasure. Starring Gerard Butler, Primetime Emmy nominee Peter Mullan (“Top of the Lake”), and Connor Swindells, and from the producers of “Black Mass” and “Hacksaw Ridge,” “The Vanishing” will keep viewers guessing until the very end. It will be available on Blu-ray and DVD for $21.99 (SRP) and $19.98 (SRP), respectively. RLJE Films will release “100 Yards” on Digital and DVD Tuesday March 5. The film stars Sean Patrick Flanery (“Dexter”), Steven Brewis (“Tabloid”), Danielle Rayne (“Switched at Birth”) and Rebecca Lim (“The Pupil”). It is the directorial debut of screenwriter Ross Campbell who co-directed with Dale Fabrigar (“Lonely Boy”). RLJE Films will release “100 Yards” on DVD for an SRP of $27.97. “100 Yards” also is available now on Blu-ray and Digital formats. Rich Porter (Brewis) had it all—talent, good looks and a bright future playing quarterback for an American football team but then tragedy struck. His mother goes missing while volunteering in a remote area of the Philippines, and Rich’s attempts to find her are in vain. Giving in to despair, he receives more bad news when he is diagnosed with cancer. Then, at the hospital, a young boy with the same condition and a compassionate nurse do their best to bring hope back to the ailing Rich. They show him that the game of his life is a struggle for every yard, but with the help of faith and friends it can be won. Urban Movie Channel and RLJ Entertainment will release “Falling in Love Again” on DVD Tuesday March 5. Written and directed by award-winning filmmaker, Dan Garcia (“Video Girl”), the story follows Henry and Tara, a recently divorced couple navigating the challenges of co-parenting their young son while recovering from the wounds of their failed relationship. But after moving on to new partners, they soon find the grass isn’t quite greener and they might just want that old thing back. The film stars Terrell Carter (“Empire”), Lamman Rucker (“Greenleaf,” “Meet the Browns”), and Erica Hubbard (“Let’s Stay Together,” “Dysfunctional Friends”). UMC and RLJ Entertainment will release “Falling in Love Again” on DVD for an SRP of $27.97. The Superman-inspired series “Krypton: The Complete First Season” arrives on Blu-ray and DVD Tuesday March 5, from Warner Bros. Home Entertainment. From executive producers David S. Goyer (“Man of Steel,” “The Dark Knight” trilogy) and Cameron Welsh (“Constantine”), the action-adventure series tells the origin story of DC Comics’ iconic Superman in a whole new way. The home entertainment edition arrives just as the second season is set to premiere on the cable network SYFY. Viewers can purchase the set which, in addition to all 10 episodes from season one, contains more than an hour of extra content, including the 2017 Comic-Con panel, featurettes, deleted scenes and a gag reel. “Krypton: The Complete First Season” is available for $24.98 (SRP) for the DVD and $29.98 (SRP) for the Blu-ray which includes a Digital Copy. Krypton: The series also available to own on Digital via purchase from digital retailers. Set two generations before the destruction of Superman’s home planet, Krypton, the series follows a young Seg-El, the legendary Man of Steel’s grandfather, who is faced with a life and death conflict—save his home planet or let it be destroyed in order to restore the fate of his future grandson. With Krypton’s leadership in disarray and the House of El ostracized, Seg fights alongside Earthly time-traveler Adam Strange to redeem his family’s honor and protect the ones he loves while saving the future of his legacy from DC Super-Villain Brainiac. The series stars Cameron Cuffe (“New Year’s Eve”), Georgina Campbell (“One Night,” “Black Mirror”), Shaun Sipos (“Final Destination 2”), Colin Salmon (“Arrow”), Elliot Cowan (“The Golden Compass”), Ann Ogbomo (“Wonder Woman,” “Justice League”), Aaron Pierre (“Britannia,” “The A Word”), Rasmus Hardiker (“Your Highness”), Wallis Day (“Will”), with Blake Ritson (“Da Vinci’s Demons,” “Indian Summers”) and Ian McElhinney (“Game of Thrones”). “Krypton” is based on the DC characters created by Jerry Siegel and Joe Shuster. The hit New Zealand detective series “The Brokenwood Mysteries: Series 5,” makes its DVD and Blu-ray debut Tuesday March 5, from Acorn TV, an RLJE Entertainment brand. After transferring from a big city to the small town of Brokenwood, Detective Senior Sergeant Mike Shepherd (Neil Rea, “Go Girls”) continues to settle into country life working with his assistant, Detective Kristin Sims (Fern Sutherland, “The Almighty Johnsons”). Despite the growing accord between the mismatched pair, all is not well in Brokenwood, where passions simmering beneath the sleepy surface regularly erupt into gruesome crimes. Shepherd and his team investigate the death of an amusement park owner killed on his own haunted-house ride, a bachelorette party gone horribly wrong, the systematic targeting of a will’s beneficiaries, and a gruesome electrocution in an abandoned asylum. The series is filmed on location in the stunning New Zealand countryside. The four-disc DVD set and the two-disc Blu-ray set features four feature-length episodes, plus a behind-the-scenes featurette ($59.99, Amazon.com). “The Brokenwood Mysteries, Series 5” made its U.S. Premiere in December on Acorn TV. Acorn TV is North America’s most popular and largest streaming service focused on British and international television. Season 4 of “Fear the Walking Dead”—the companion series to the hit cable series “The Walking Dead”—arrives on Blu-ray (plus Digital) and DVD Tuesday March 5 from Lionsgate. Morgan Jones crosses over into unknown territory as the worlds of “The Walking Dead” and “Fear the Walking Dead” collide. “Fear the Walking Dead: Season 4” stars Lennie James (“The Walking Dead,” “Save Me”), Alycia Debnam-Carey (“The 100,” “Into the Storm”, Kim Dickens (“Miss Peregrine’s Home for Peculiar Children,” “Gone Girl”), Frank Dillane (“Sense8,” “Harry Potter and the Half-Blood Prince”), Colman Domingo (“Selma,” “Lincoln”), Danay Garcia (“Prison Break”), and new season regulars Maggie Grace (“Taken,” “The Hurricane Heis”), Garret Dillahunt (“12 Years a Slave,” “No Country for Old Men”) and Jenna Elfman (“Dharma & Greg,” “Friends with Benefits”). The home entertainment release of “Fear the Walking Dead: Season 4” includes four different audio commentaries with cast and crew, providing an in-depth, personal account of how episodes 401, 405, 410, and 416 were made. The Blu-ray and DVD will be available for $44.99 (SRP) and $39.98 (SRP), respectively. Front Row Features wants you to enjoy some quality time with your family. That’s why we’re giving away a copy of the hilarious and heartfelt family film, “Instant Family,” on Blu-ray/DVD Combo Pack to two lucky readers so they can sit down and watch the movie with their kids. To enter the contest, simply email socalmovieeditor@aol.com by March 11 for your chance to win. Good luck! Next PostPhotos: ‘Instant Family,’ ‘Krypton,’ ‘Brokenwood Mysteries,’ More on Home Entertainment … Plus Giveaways!!! ‘Hands of Stone,’ ‘I.T.,’ ‘Mechanic’ and More on Home Entertainment … plus giveaways!